As Delaware educators, we fully understand the value of technology in education. Technology pervades our daily lives and routines—especially for young people—and tech skills are increasingly in-demand in the workplace. In our classrooms, we utilize digital tools and platforms like Schoology and Kahoot to deliver lessons, pop quizzes, keep track of student progress, and so much more. Technology is supposed to make our classrooms more streamlined and engaging—but it isn’t always that simple. We should be able to just press a button and turn on a computer or iPad for our students, but this year we learned that Delaware has a patchwork system to provide broadband services to schools and it’s often unclear where the problems lie when something doesn’t work in our classrooms. 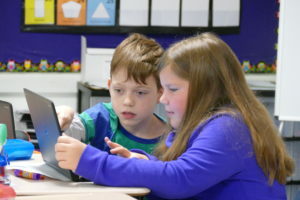 While Delaware has made dramatic advances in both networking technology and the types of online content available, some schools still see repeated issues when it comes to harnessing the power of technology in the classroom. Plus, with new devices being added to the network every year to accommodate an increase in tech-enabled teaching and learning, the state’s broadband capacity will have to be updated regularly just simply to keep up with the growing demand. And if we don’t act soon? Slow internet speeds, crashed servers, and an overall inability to provide digital instruction for our students. Last fall, one of our teacher council members attempted to teach a civics lesson where 30 students were required to log onto YouTube, watch historic presidential debates, and then compare them to the contentious Trump-Clinton showdowns happening at the time. The students eagerly grabbed their devices, hit the on button, and began the assignment. Now imagine their disappointment (and the teacher’s!) when a few short minutes later the YouTube videos stopped loading and the class was unable to complete the assignment. It’s frustrating! A big part of the problem is a lack of transparency around this issue. There are so many agencies and entities that coordinate school technology: state, district, and even school-level decisions and investments affect outcomes. There’s currently no way for teachers, parents, or community member to find out how connected their school is, or how their school’s infrastructure compares with others. Here is an example. Many of us use a program called Kahoot in our classrooms to deliver quizzes in a fun way. For some of us, the platform loads in less than a minute. Others? Close to 10 minutes. Are they merely using two different browsers? Is it a matter of too many students logging in at once? Or does one district just have more bandwidth than the other? We don’t know! As the Rodel Teacher Council broadband working group, we believe that Delaware should provide adequate access to school-level broadband. And, to achieve this goal, the state needs to invest in increasing connectivity and providing the public with information on broadband infrastructure. Over the past year, we collaborated with local and state leaders to develop and advocate for a policy that would require an annual review and public reporting of school-level broadband. The policy passed during this year’s legislative session and soon the Department of Education and Department of Technology and Information will conduct the annual review using an existing performance-reporting tool. The annual public report will tell us where additional bandwidth is needed in order to support equitable planning and investment in districts, schools, and students as well as allow districts to learn from one another on how to maximize bandwidth for the benefit of their students. We know there is more work to be done but we are also thrilled to see the inclusion and passing of this policy in our state. We look forward to analyzing the data from the annual report and collaborating to identify solutions that benefit our students, fellow educators, and schools.